By the NCAA's standards, Cal will be taking a step down in class this weekend when it visits BYU Saturday night, a week after defeating North Carolina. The Tar Heels are a respected member of the ACC, a so-called "Power 5" conference. The Cougars are a football independent that plays basketball in the same "mid-major" league that St. Mary's and Santa Clara do and had a 4-9 gridiron record in 2017. But that assumption does not pass the eye test. Brigham Young, which defeated Pac-12 member Arizona on the road last week, clearly looks better than North Carolina. The Wildcats, who beat Cal in overtime in Berkeley last year, were favored over BYU and got shoved around, especially at the end of the game. Under new offensive coordinator Jeff Grimes, the Cougars' attack was imaginative and efficient if a little conservative in Tucson. Quarterback Tanner Mangum, whose season a year ago was cut short by an Achilles injury, won back the job with a solid Fall camp. Like many BYU athletes, Mangum took two years off from his sport to go on his Mormon mission. He is a mature quarterback in every sense of the word. He turns 25 on Saturday. "I think I recruited him at Texas A&M," said Cal defensive coordinator Tim DeRuyter, who last worked in College Station in 2011. Mangum has his limitations, his arm is not the strongest, but he knows what he is doing and makes few mistake, witness no turnovers in the opening game. The defense, led by versatile linebacker Sione Takitaki (16 above), neutralized Arizona QB Khalil Tate, who gave the Bears fits in 2017. Of course, the Cougars were helped by the Cats' mystifying play selection. Tate is an effective passer, but one of the better runners in the country. Not among just quarterbacks but including everybody. Officially he carried the ball eight times for 26 yards, but that total includes one sack for minus 12. On most plays the Cougars had 6-9 defensive end Corbin Kaufusi hanging out as a "spy" just to ensure Tate wasn't going to get any ideas about running. But given the opportunity Tate is elusive enough to get away from nearly anybody. Arizona chose to limit those chances, for with BYU should be eternally grateful. BYU head coach Kalani Sitake is in his third year at his alma mater. In his first season BYU went 9-4, including a victory in the Poinsettia Bowl. Last year the wheels came off as a rash of injuries and mistakes resulted in a seven-game losing streak. Now the Cougars are relatively healthy and off to roaring start. "I think we hit on the points that we needed to improve on and the film confirmed it," Sitake said of the Arizona win. "It was a good learning opportunity for us and the fact that we got a win is a huge positive. I was really pleased with the players’ effort. We had a lot of young guys contribute in this win, and I think we’re going to keep adding young guys as we go along." "They are physical up front, they've got good tight end play," Cal head coach Justin Wilcox said in the Pac-12 coaches conference call this week. "The quarterback is a veteran guy, he's a good thrower they create a lot of misdirection giving you fly sweeps, motion, there are a lot of pre-snap movement and they've got good players executing the schemes." Mangum won a tight battle in training camp with highly-regarded freshman Zach Wilson for the quarterback job. Against Arizona he completed 18 of 28 passes for 209 yards and a touchdown. More importantly there were no interceptions as the Cougars, like the Bears they did not turn the ball over. "I was really pleased with the things that he did, the changes he made at the line of scrimmage," Sitake said. "There at the end he managed the offense, milked the clock. It helps to have a guy who's been there before." Mangum has done that. This will be his 23rd start. The Cougars had 183 rushing yards, 98 of them by running back Squally Canada (perhaps the greatest name in college football. He scored three touchdowns, but Sitake pointed out he did more than just run with the ball. Ten different receivers caught passes, a formula that Sitake likes "That is the kind of offense we have to have, we can't just lean on one guy," he said. "With all of that we also ran our jet sweeps with our receivers. We spread the wealth a little bit." It also makes things difficult for the defense. Last week Carolina had one top-notch receiver in Anthony Ratliff-Williams and were consistently trying to get the ball to him. Cornerback Camryn Bynum, often with some help, was able to keep him under control. Things will be different this week. "You can't double five guys," DeRuyter said. "It makes it difficult to know who their go-to guy is. We'll see, we've got more guys than just Cam Bynum who can play. You are playing a well-coached team and they've got some talent. You've got to mix things up. Sometimes you'll play man, sometimes you're playing multiple zones. Trying to make it so the quarterback has to figure it out on the run." Those jet sweeps Sitake referred to were most effective. "You have a lot of fast guys in space," Sitake said. "It's like an extension of the bubble screen, quick throws out there. It's just easier to hand the ball off and get it out there. For us it's a good way to spread the ball out." Of the seven Cougars who carried the ball from scrimmage, four were wide receivers. That is something Cal must guard against. One of the more intriguing stories among the receivers is Dylan Collie, who returned to Provo after a five-year absence. He redshirted as a freshman in 2012, then served a two-year mission. He then decided to transfer to Hawaii, where he was a productive receiver for three years. But this fall he is back at BYU as a graduate transfer. In the opener he caught one pass for 22 yards and gained 13 yards on a sweep. Tight end Matt Bushman was a freshman All-American last year and he has plenty of help. BYU used five tight ends on Saturday, not all at once, although to Arizona it might have seemed like it. "It's interesting, we're trying to get a bead on which ones are in certain packages. We think we've got a decent bead on that, and you just have to go with the one game"
Moroni Laulu-Pututau was the most productive at the position with three catches for 24 yards. The offensive line, which dominated Arizona in the fourth quarter as the Cougars put the game away, averages better than 300 pounds per man. "The biggest team we will see all year," Arizona coach Kevin Sumlin said. Right tackle Austin Hoyt, who checks in at 315 pounds, said that owning the line of scrimmage was the goal going in. "That was the number one key to this game, to physically dominate at every position," Hoyt said. "It is something that Coach (Ryan) Pugh talks about every day, the importance of being physical and violent and manhandling people. I think that was something that we thought about going into the game and I’m glad we were able to do that." The Cougars use a base 3-4 alignment, although they can put four or more on the line of scrimmage, depending the situation. When they do load up the box they have a slightly different approach than North Carolina did against the Bears. "They don't take the entire air out of it as much, they have a little bit more space," Cal offensive coordinator Beau Baldwin said. "They kind of box it in and keep things in front of them, a little more than North Carolina which was bringing everybody up to the line of scrimmage. But they do, they get in post safety, they get in split safety and they make plays. "They have good eyes, they see things well. they're well-coached, they're strong, they have the ability to get off blocks, They have a physicality at every level on defense." 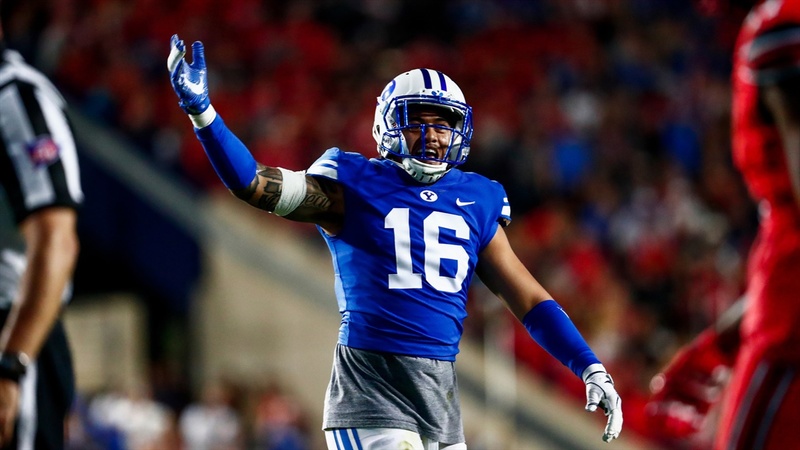 Takitaki was called BYU's "most important defender" by annuncer Rod Gilmore. "He can defend the run, cover and rush the quarterback." He was credited with four tackles, all of them behind the line of scrimmage, and broke up two passes. A 6-2, 230-pound senior from Fontana, Ca., Takitaki has several brushes with the law and been suspended from the team three times. However he has straightened his life out and was voted a team captain for the season. Corbin Kafusi uses his 6-9 height to disrupt quarterbacks and is mobile enough run down fleeing quarterbacks. He had the Cougars only sack last weekend. He recorded seven tackles, two tackles for loss and one sack. It was his third game with multiple tackles for loss. The defensive front is not as massive as the offensive line, but nose guard Khyris Tonga represents 340 pounds that the Bears have to find a way to move. The secondary is experienced but was whistled for three pass interference penalties. "That wasn't too great," Sekari said. "We need to clean that up. There were a couple of them that were definitely good calls. I can't complain about every call that doesn't go in our favor. "They were in good position, it wasn't blown coverages. Just have to execute technique better, have their eyes in the right spot, I think they'll be fine. ....I would like to see them come down with more pics." True freshman Skyler Southam, a high school All American, went on his mission directly out of high school, then enrolled and won the place kicking job in the Fall. As a prep he hit 70 per cent of his field goal tries, including one from 53 yards. He did not attempt a field goal Saturday, although he hit all four of his PAT attempts. Rhett Almond, who was once the placekicker, is now the punter. He averaged 40 yards on his four punts Saturday. Defensive back MIchael Shelton, the starter at left corner, was a special teams terror, blocking a field goal and returning a punt 37 yards. Provo is 4,500 feet above sea level, but the thin mountain air will not pose a big problem for the Bears, according to Wilcox. "There is science behind all that," he said. "They (the players) are maybe going feel a littl dry mouth, but there will be plenty of oxygen. They're not going to move the stadium. The altitude is what the altitude is." No Wilcox is more concerned with moving the football than moving the stadium. The Bears' three-headed quarterback system will not catch the Cougars by surprise the way it did Carolina. If the Cal secondary can shut down the BYU receivers and produce some turnovers, the Bears have a shot. If not, it could get ugly. This is the fifth meeting between the two. ...BYU leads the series, 3-1....The lone Cal victory was in the 2005 Las Vegas Bowl. ...Tom Holmoe, who was Cal's head coach from 1997 through 2001, is athletic director at BYU, his alma mater...BYU is tied for No. 1 with Navy for the most wins (24) over Power 5 opponents by a non-Power 5 school since 2003. ...The average age of BYU’s roster is 21.5. The Cougars also have 25 married players. Six of the married players have a child.